Imagine the Roman emperors still ruled today—and kept ruling until the year 3000 C.E. Imagine an American president still presides in the year 4800—governing roughly the same part of North America as today and operating under American traditions and laws, including the U.S. Constitution. In other words, imagine a government and society lasting three thousand years, with only the occasional interruption. That’s how long the Pharaohs reigned over ancient Egypt. Narmer Palette, c. 3100 B.C.E. To the right is a carved palette of Narmer from his own time. And below is a relief of Cleopatra’s great-grandfather, Ptolemy VIII, who died in 116 B.C.E. Even I can tell they come from the same culture, despite a three millennium separation. Ptolemy VIII, c. 120 B.C.E. And the connection wasn’t just skin-deep (or stone-deep). Narmer and Cleopatra presided over the same political system, more or less, with a god-king on Earth ruling roughly the same territory, in the name of the same pantheon of gods (despite some additions and subtractions), presiding over a powerful but obedient priesthood, who wrote in the same hieroglyphs and told roughly the same stories to the people, who farmed the same land in roughly the same way and spoke essentially the same language. Change of course happens in every society, and an Egyptian transported from 3100 to the last century B.C.E. would find much confusing, even bewildering. But he’d know he’d landed in Egypt, and that the heavens remained in order and that the pharaoh and his priests still represented the gods. In other words, the nation recognizable as Egypt remained and was easily recognizable three thousand years after its birth. That immense lifespan makes Egypt unique in the world. Chinese history can claim a longer span–almost four millennia by some counts—but no culture can match Egypt’s level of political and cultural continuity over three thousand years. The best sense of Egypt’s amazing duration comes from a glance at the changing world around the land of the Nile. At the start of ancient Egyptian history, civilization had taken hold only in Sumer (Southern Iraq/Mesopotamia) and Egypt itself. Elsewhere, the Middle East was a land of primitive villages and foragers, as was the rest of the Old World. At the end of ancient Egyptian history, sophisticated civilizations had sprung up across Eurasia and North Africa, and the land of the Nile had to contend with vast empires like the Roman Republic. At the start, metal tools had only just begun to replace stone, and the Bronze Age was a newborn. At the end, the Iron Age was a thousand years old. At the start, “writing” was little more than a system of picture symbols for record-keeping, allowing Sumerian and Egyptian priests to track livestock and grain supplies. At the end, alphabets had spread across the Mediterranean world, and authors like Plato, Herodotus, Cicero, and Virgil had used them to transmit poetry and wisdom that has students scratching their heads to this day. At the start, the Old World’s largest buildings were mounds of stone, earth, branches, or mud bricks. At the end, Eurasia was dotted with towering and breathtaking works of architecture and engineering, like the Parthenon of Athens, Rome’s amphitheaters and aqueducts, China’s lacquered wood palaces and temples, and of course the Great Pyramids of Egypt itself. In other words, Egyptian civilization and the reign of the pharaohs spanned not just thousands of years but ages of human history. 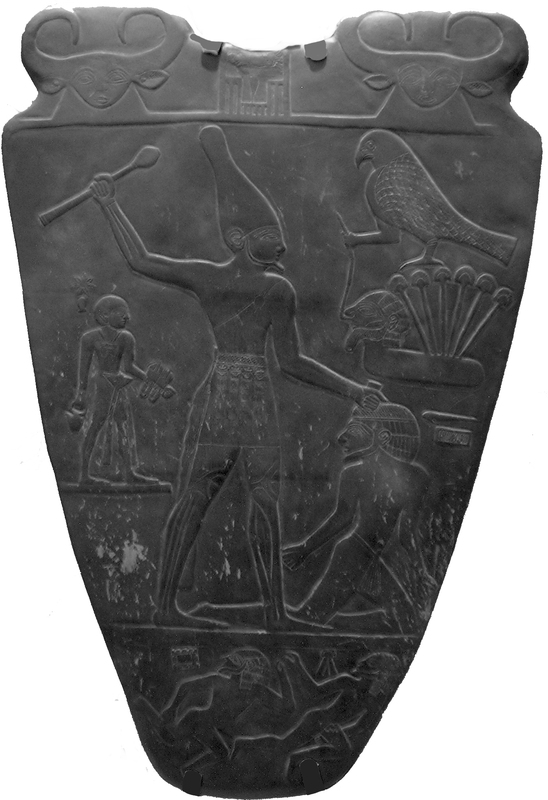 “Narmer Palette,” cropped, courtesy of Wikimedia Commons. 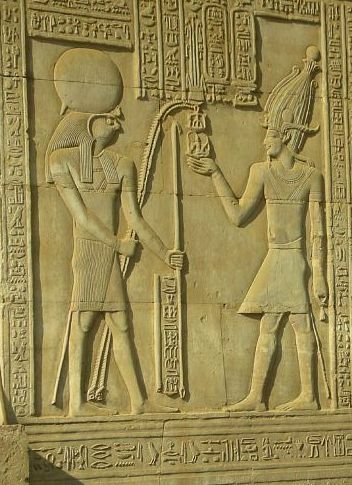 “Ptolemy VIII relief, Temple of Kom Ombo, Egypt,” cropped, by Shannon Hobbs, courtesy of Wikimedia Commons. © 2011, 2016 by David W Tollen. Never knew that. Certainly gives us hope that the US can make it another couple hundred …. Yup. Let’s hope the U.S. is like Egypt, rather than, for instance, the Palmyrene Empire: 260-273 C.E. Your perspective across the ages really imparts a palpable sense of ancient Egypt’s astonishing longevity. What a robust civilization! Any thoughts on how the Egyptians achieved such unparalleled stability? Or is that one of the Sphinx’s secrets? (1) Unparallelled conservatism. They laid down their ways and means of life during the Old Kingdom, and they just didn’t want anything to change from then on in. (2) Lucky Geography: The Nile River Valley is ideal for civilization and stability. The river’s flooding is mostly predicable and supports agriculture very neatly. And surrounding deserts keep enemies at a great distance most of the time. Plus, the two-dimensional geography–nowhere to go but north and south–makes rule by a single power easy, since there aren’t too many roads and byways to guard and dominate. So division into competing governments was very rare. You could argue that Egyptian civilization started to end–and finally ended–when technology overcame Egypt’s wonderful isolation. By the time of the Persian Empire, cavalry and effective shipping made Egypt more accessible to enemy armies than ever before. And iron became crucial, yet it wasn’t a resource the Egyptians had in spades. The age of big classical empires had arrived, and Egypt couldn’t avoid it. Maybe the Egyptians just gave up a few centuries later when the Romans took over. They had no choice to play a part in the larger Roman world, so clinging to very ancient ways no longer made sense.